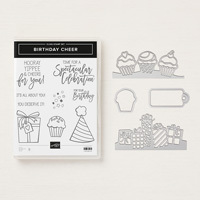 Birthday Cheer Cling Stamp Set by Stampin' Up! Hats, presents, and as many cupcakes as you like! Create spectacular birthday projects with this set.